United Nations, Jan 17: “Peace. Justice. Human Dignity. Tolerance and Solidarity- Today values are under attack around the globe”, said Antonio Guterres, Secretary General while addressing UNGA on Wednesday. 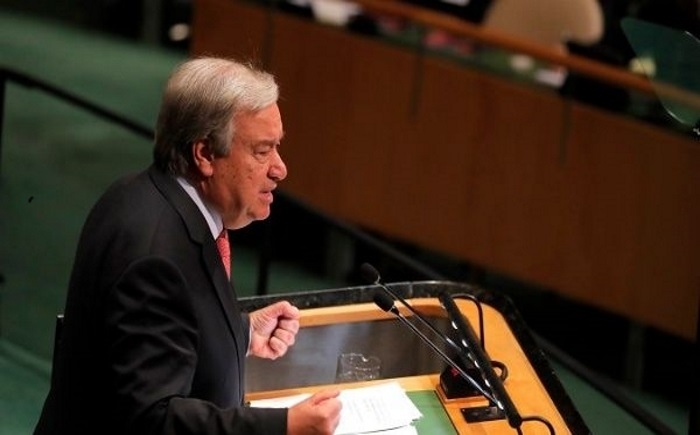 Antonio Guterres, Secretary-General of UN started his address by offering condolences to the people and the Government of Kenya for the loss of life in yesterday’s horrendous terrorist attack. He added, we all strongly condemn this incident. He emphasized that Armed conflict threatens millions and forced displacement is at record levels. Poverty is far from eradicated and hunger is growing again. Inequality keeps rising, And the climate crisis is wreaking havoc. We also see growing disputes over trade, sky-high debt, threats to the rule of law and human rights, shrinking space for civil society and attacks to media freedoms. These ills have profound impacts on people’s daily lives. He said that, most disturbingly, we hear the troubling, hateful echoes of eras long past and noxious views moving into the mainstream.